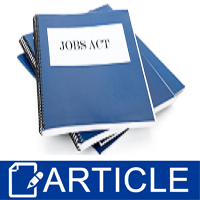 The JOBS act signed into law in April 2012 is designed to enable businesses to raise startup and operating capital. It reduces the burden of certain securities regulations to promote equity “crowdfunding” as a viable funding source. While the concept of crowdfunding isn’t new, the Internet has greatly expanded the capability of entrepreneurs to exploit it. Crowdfunding is broadly defined as funding a venture by raising relatively small amounts of money from a large number of non-accredited investors. Entrepreneurs that found it difficult or impossible to raise venture capital or obtain loan financing now have a direct link to the general public as potential investors. This act relaxes the restrictions normally associated with public equity offerings. Some of the platforms now available or preparing to enter the market to capture investors are: Kickstarter, Fundable, Crowdfunder, EarlyShares, Indiegogo, SeedInvest, GetFunded, WeFunder, RelayFund, GreenUnite, New Jelly, CircleUp, Appsfunder, and RocketHub. By using these platforms to attract investors, the door will be open to any business to accept money from family, friends, work acquaintances, as well as complete strangers. In exchange for their money, investors will receive an equity position in the company. The general approach to launching a crowdfunding campaign starts with the creation of an online company profile. This includes an introduction to the company and its management, the products or services it will provide, appropriate images, and a first-class video that projects a compelling message to potential investors. It’s worth the investment to have the video produced by someone who does this for a living. A formal business plan projects a professional image that will likely attract more investors. A crucial part of this is market research that makes a strong case why the average person should invest with you. Think like a public relations expert and put together a marketing pitch that will drive your message home. The next step is to publicize the profile to the widest audience possible, especially target demographics that might support your project. This is accomplished through traditional media outlets, email lists, professional contacts, and showcasing through social media. Ask your friends and family to help pass the word to their contacts and acquaintances. The key is creating a network that generates buzz and publicity that will spread as enthusiasm and momentum build for your product. Getting people to part with their money isn’t easy, especially if they’ve never heard of you before. Having an outstanding profile and marketing presentation will go a long way toward convincing investors to take an interest. Beyond that, you should try to connect with them on a psychological level. Give your business a purpose that investors can relate to and believe in, and appeal to all their senses when conducting your marketing campaign. Once your campaign gains some traction, it will feed on itself. Do it right, and people will come out of the woodwork to help you succeed. Your success eventually becomes their success. The provisions of this act are somewhat complex, especially if you’re not familiar with Securities and Exchange Commission (SEC) regulations. The highlights are summarized below, but you may need the assistance of a financial advisor or attorney to understand and comply with the detailed rules and requirements. This article is intended as only a starting point for you to take advantage of the act’s potential benefits. Small business owners should not be intimidated by the dollar thresholds included in these provisions. They are upper bounds, meaning any smaller business is eligible to use the crowdfunding vehicle to raise needed funding. 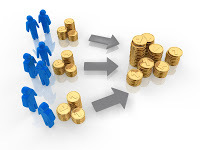 § You can raise money by selling shares of your company through the crowdfunding process. This process was previously restricted to business owners and artists who accepted relatively small amounts of money in exchange for rewards of nominal value (such as CDs or copies of artwork). Another significant change is that investors don’t have to be accredited, which means they don’t have to meet the standards of a traditional venture capital firm. There are limits to annual investments based on net worth and income. § You can now use advertising to attract investors to a private stock offering. Such solicitations were previously banned by an SEC regulation. Sales are limited to qualifying investors. § You can raise a lot more money, with the capital threshold now raised from $5 million to $50 million per one year period. Amounts above that require SEC registration. § Under current regulations, any company with assets exceeding $10 million and more than 500 investors must register their stock with the SEC. With the new law, the threshold is raised to 2,000 investors or 500 non-accredited investors. Investors that acquire equity under the new crowdfunding provision are excluded from this limit. This opens the door to more extensive fundraising without having to become a public company. § Emerging growth companies with annual revenues less than $1 billion will get temporary relief from some SEC public offering regulations and certain reporting requirements. This will make it easier and faster to raise capital. § The act extends the compliance periods for certain requirements originating from the Sarbanes-Oxley Act, from two years to five years. § Community banks don’t have to register with the SEC unless they have at least 2,000 investors and $10 billion in assets. This is good news for businesses seeking financing since community banks are often a primary source of small business loans. Before the passage of this act, less than 1% of small businesses in the U.S. received angel investments. If they couldn’t get a loan, they were out of luck and on their own. The JOBS Act creates portals for investment by people who have been shut out in the past. Crowdfunding will help new entrepreneurs kick start their businesses and inject more capital into the struggling economy. If you own a company and have had difficulty obtaining financing, this may be an option to be seriously considered.